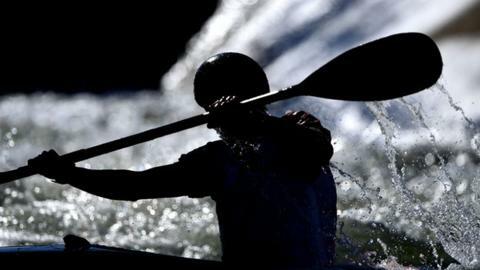 British Canoeing said it was "very concerned with the leaking of the draft report"
"An environment in which abusive behaviour could thrive" and athletes were "too scared" to challenge decisions may have been created by the handling of complaints at British Canoeing, according to an independent review's draft report. An inquiry into one of the country's best funded and most successful sports was launched in 2017 after serious allegations surfaced about a coach. The panel's confidential draft report, seen by the BBC, claims that the former staff member was "allowed to 'reoffend' while hiding in plain sight" years after "rumours and complaints of serious sexual misconduct" first surfaced in what was a "systematic abrogation of responsibility". It is also critical of UK Sport, concluding that a "'culture of fear'...extended downwards" from the powerful funding agency to British Canoeing. "This 'culture of fear' flourished in an environment where so long as British Canoeing appeared successful, no proper checks and balances were implemented to scrutinise the way in which success was being achieved," it said. The former coach, who was suspended and then resigned, was alleged to have had an inappropriate relationship with a female athlete, and to have threatened an athlete's parent, among other complaints. He was not interviewed as part of the review after declining to take part, and denies any wrongdoing. He says that he was never the subject of any conclusive disciplinary procedure during his time at British Canoeing and was given positive appraisals throughout. The panel concluded some key individuals were "'untouchable'…able to act with impunity and without fear of repercussion". It said it found evidence the selection process had been "manipulated", and that management "marginalised those who had complained". In separate statements, both UK Sport and British Canoeing said they were "disappointed" the legal process known as 'Maxwellisation' - whereby those criticised are given the opportunity to respond - was still ongoing, and that they they could not comment further as a result. British Canoeing - which has undergone a change of leadership since the allegations were raised - also said it was "very concerned" that the draft report had been leaked. The BBC understands that UK Sport was not invited to participate in the investigation, and disputes elements of it. The British Canoeing team has become one of the best in the world, receiving £22m for its performance programmes from UK Sport after a record medal haul at the Rio Games in 2016. But the following year an independent review into "governance, corporate responsibility and behaviour" between 2007 and 2017 with regard to "allegations around the conduct and behaviour of individuals" employed by the organisation was launched. It came after allegations surfaced about a coach who was suspended and then resigned amid a disciplinary investigation. A former Met Police officer was appointed to lead the investigation and report to a panel of three lawyers selected by arbitrators Sport Resolutions. The much-delayed findings - eventually delivered to British Canoeing more than a year late at the end of 2018 - are yet to be turned into a final report. "too many serious and genuine complaints were either dismissed out of hand or mishandled". management were aware of an allegation that an athlete had spent time alone in the coach's room at the Youth Olympics. While "unable to conclude on balance that a cover-up took place, the panel is in no doubt that this allegation was not dealt with appropriately". There is no suggestion that the alleged athlete was underage. 20 athletes wrote a joint letter saying they did not want to be trained by the coach, but he was then invited to attend a meeting with them, making them feel they could not speak honestly, before he was moved to work with a different group of athletes. a complaint that the coach made an abusive and threatening phone call to an athlete's parent was "brushed under the carpet". management suspected or knew the coach was having an inappropriate relationship with a female athlete, but "it was decided the allegation was malicious and the investigation closed". even with "rumours and complaints of serious sexual misconduct going back to at least 2004", the coach "continued to behave in ways which were harmful to athlete welfare". the "opacity and iniquity" of the complaints procedure… at best had a devastating effect on confidence and morale… and at worst this potentially created an environment in which abusive behaviour could thrive". it was "extremely unfortunate" that a previous disciplinary process into the coach was wrapped up after he resigned, raising concerns that he could "still present a risk… to a different community" and jeopardising trust. British Canoeing is understood to dispute this, insisting to UK Sport that the coach was sanctioned. there was evidence a "deny and defend culture" existed as early as 2004.
a lack of "any adequate records" regarding key complaints/investigations, and a lack of proper policies and procedures that "gave rise to a quasi-feudal culture permeated with a lack of accountability". "specific allegations of bullying" by the coach in 2014 were not dealt with adequately "given the bigger picture". In a statement British Canoeing said: "In April 2017, several serious allegations were brought to the attention of British Canoeing and as a result, UK Sport and British Canoeing jointly commissioned Sport Resolutions UK to carry out an independent investigation into British Canoeing's governance, corporate responsibility and behaviour with regard to how it dealt with these allegations at the time. "In doing so, British Canoeing fully acknowledged the seriousness of the allegations and the importance of an independent investigation. "British Canoeing has always been committed to responding to the final report, with an intention to publish its key findings and recommendations in line with the agreed Terms of Reference of the investigation. "The current position in the investigation is that the draft report of Sport Resolutions UK is subject to 'Maxwellisation'... which will then be considered by Sport Resolutions UK. "British Canoeing is disappointed that the process has not yet reached a conclusion and we are very concerned that with the leaking of the draft report, the integrity of the Maxwellisation process has been compromised. "Both the investigation and draft report are subject to strict confidentiality terms and under the terms of our engagement with Sport Resolutions UK we are unable to comment any further at this stage." The coach declined to comment, but the BBC understands he was not interviewed as part of the review after declining to take part, and that he denies any wrongdoing. "The relationship with UK Sport is key"
British Canoeing's independent review in 2017 came amid a raft of athlete welfare controversies in elite performance programmes at a host of other publicly-funded sports governing bodies, including British Cycling and British Swimming. Since then, UK Sport has taken a number of steps designed to improve duty of care and welfare, including a public consultation, new funding for the British Athletes Commission, a culture survey, and a new Sports Integrity department. However, with just over a year to go until the Tokyo Games, the findings detailed in the draft report threaten to cast a shadow over both the governing body, and the funding agency. The panel repeatedly highlights the potential role played by UK Sport's approach to funding - linking money to medal potential - when it came to the "historic malaise" at British Canoeing, and appears to criticise a lack of oversight by the funding agency. "In light of the significance of this funding, it is easy to see why a Machiavellian approach... might develop, together with all the associated dangers that such an approach entails," the panel wrote. "It is not difficult to understand why for some in British Canoeing, the ends always seemed to justify the means - be it the pursuit of winning medals or trying to ensure superficially at least - that the organisation appeared to be well run and robust," it added. "The panel determined that this 'culture of fear', somewhat ironically, also extended downwards from UK Sport to British Canoeing - in the simplest of terms 'no medals equals no funding'. "This 'culture of fear' flourished in an environment where so long as British Canoeing appeared successful, no proper checks and balances were implemented to scrutinise the way in which success was being achieved. "Given the panel's conclusion, that the perception of many elite athletes was that the priorities of British Canoeing were skewed in favour of UK Sport, the panel recommends that British Canoeing conduct a review and that any imbalance is redressed, ensuring that athlete welfare is paramount. "The relationship with UK Sport is key - if the primary focus continues to be on medals, there is a risk that a win at all costs culture cannot be effectively challenged." In a statement UK Sport said: "It has always been our intention to publish the report's key findings and recommendations, and we are disappointed the process is still ongoing. "The status of the report is still currently draft and as far as we are aware, undergoing Maxwellisation... While the report is still undergoing this process, and until we have the final report which has duly considered all the representations, we are unable to comment any further." Since the review was launched in 2017 there has been an overhaul of leadership at British Canoeing, and the draft report says that the new management "is making enormous strides in the right direction". It also adds that the "current climate provides an ideal opportunity to ensure systematic failures of the past are not repeated". In light of the coach's "sustained misfeasance", that management consider reporting him to "the proper authorities for consideration of whether to instigate criminal proceedings", and "ensuring that he is not afford the opportunity to repeat behaviours and prevented from working in an environment where such an opportunity might present itself." It is understood that the coach was the subject of a criminal investigation, but no charges were brought against him, and the case has been closed. Selection policies and complaints procedures undergo "urgent reviews". A safeguarding review - first recommended in March 2017, is undertaken without further delay. A review of the interrelationship between BC, UKS and elite athletes, "and that any imbalance is addressed". How to get into canoeing - from calm, steady touring to racing down white water. How to get into canoe sprint - head-to-head racing or simply learning to paddle along a waterway near you.